Jo was trying her best to find homes for the dogs she'd literally saved from a one-way trip to Animal Control in Florida. We stopped to talk to her and I got a 'greyhound hug' from a big handsome boy named King. I'll never forget that dog and it sure wasn't hard for Robert to convince me to take a greyhound! In the end Jo suggested we wait until the next time she came from Florida and she would choose a couple for us to pick from. The day they arrived would change our lives forever. Angel, Stubby, and Sunshine jumped out of that van and stole our hearts. We decided to keep the family together by adopting all three of them - we were amazed to discover that they were all littermates! You can see their picture on the cover of the book Greyhound Tales, and my story of their unusual adoption is featured among the chapters. That was the fall of 1994 - all three had just turned 2 years old. It didn't take long for us to get the greyhound obsession. Porter in Easley who was doing adoptions and running a doggy playday occasionally in Simpsonville. 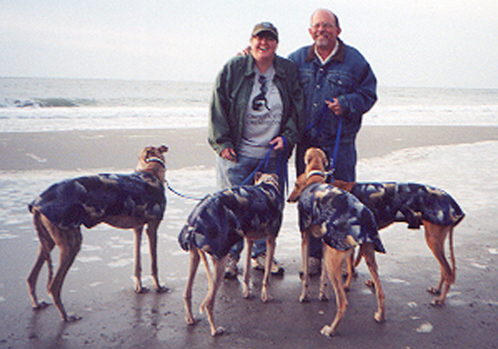 We began to make greyhound friends and found them to be the most delightful group of folks in the world. Robert and I worked to organize the Greenwood Pet Expo in 1997 and invited Emily Moore, a terrific young lady doing adoptions in Augusta, to come set up a booth. By the fall of 1997 I was helping her and beginning to think this was something I really wanted to put serious effort into. Jo Jenkins, still around and working at the tracks in Florida, encouraged us and promised to help. Without really making any formal plans, we decided to help in a small way. Our minds were made up when Jo told us that the mother of our dogs needed a home! Cagin Chablis became our first official foster at the grand old age of 12 years old. By January of 1998 we accepted two dogs from the Greenwood Humane Society that had been dropped off by their owner and our adoption group was born! 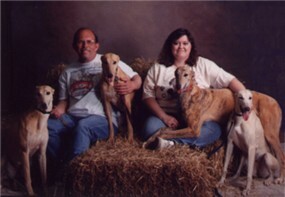 We began with the name "Friends & Family, Greyhounds & Love". In the first photo taken for the group, Jo is shown holding her dog and two fosters. I have Sunshine and Angel. We were hosted by Greenwood Pet Supply in Greenwood, SC. 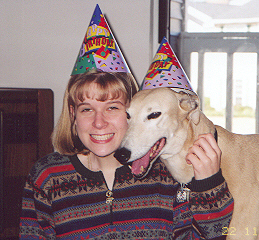 In March of 1998 we hosted another Pet Expo, this time running the greyhound booth ourselves! A short time before, we walked the Anderson Jockey Lot all excited about this new adventure telling everyone possible about the event. We met Marianne Lyles and Terry Howard there and were thrilled to find they wanted to adopt! They filled out an application which we processed and planned to attend the expo. We had a wonderful time that day and it helped two dogs find their families... Ramblin Man and Identity Crisis. Marianne and Terry were so excited that they wanted to help us by fostering! 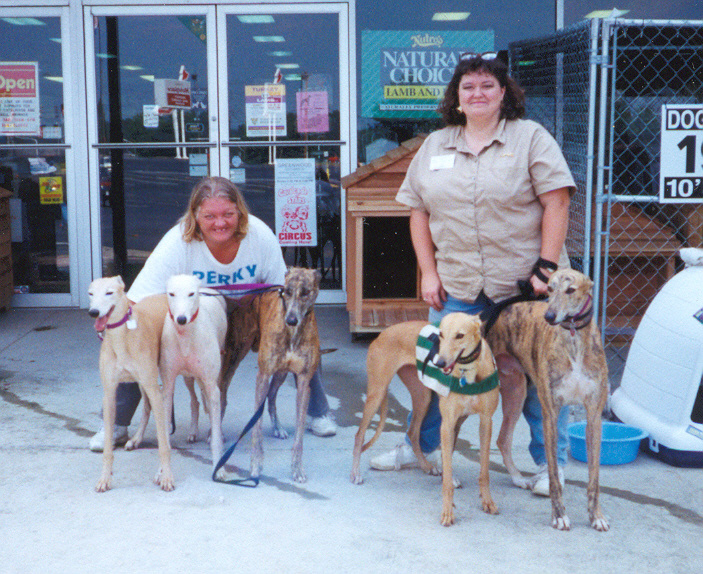 In the end we supported them in adding greyhounds to their local Humane Society work, keeping the 'Greyhounds & Love' portion of our old name after we switched to the new official title of Greyhound Crossroads. By the summer of 1998 Robert and I knew there was no turning back and began researching what had to be done to make it 'official'. We registered with the state, legally incorporating as an SC non-profit charity. Back then there wasn't much help available and incorporating was a frightening process! We basically decided to plunge ahead and learn as the experiences came to us. The 'adoption scene' was much different then - most vets in this area had never worked on greyhounds, the big Greyhound List only had 300 members (a User Group for emails, something that's very much in the past now), several other adoption groups in SC had closed, and little more than rumors and stories was known about the life of a racing greyhound. Slowly, after many moons of Angel and I doing Meet and Greets alone, the group began to grow. Instead of doing one adoption every few months, we were doing them slowly on a regular basis. The first several years we lost more money out of our pockets than I want to think about because we hadn't worked up to the relationships we have now for vet care, fostering, etc. Thank goodness, folks who adopted from us started becoming more involved and offered to help. Bit by bit, dog by dog, all of us together formed the group you see today. There's really no way to express here the time, energy, and commitment it took, or the pride I feel in the people who ARE Greyhound Crossroads. I give full credit to every hour that every GC volunteer gives toward the well-being of our members and their greyhounds. Without them, I would still be sitting alone doing Meet and Greets.